Larnaca, Cyprus. 12 April 2019. 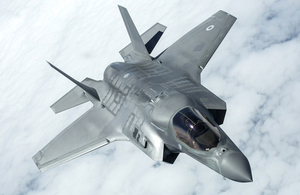 UK’s airforce base RAF Akhrotiri in Cyprus is expecting new guests this year. 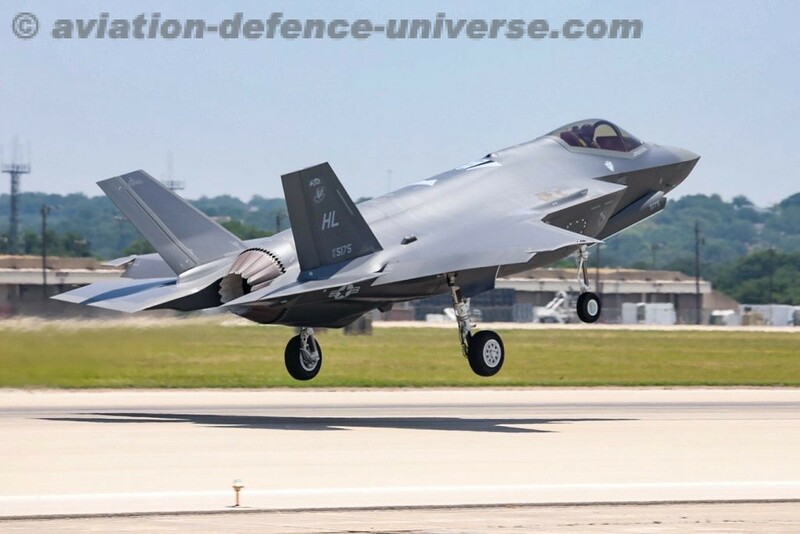 As per a UK MOD statement Britain’s F-35B aircraft will depart their home station of RAF Marham in Norfolk later this year for Cyprus in their first overseas deployment. The station commander has a dual role and is also the officer commanding the Akrotiri or Western Sovereign Base Area, reporting to the commander of British Forces Cyprus who is also the Administrator. mid-1950s to relieve pressure on the main RAF station on the island, RAF Nicosia. In the aftermath of the Egyptian repudiation of the Anglo-Egyptian treaty, British forces had to be withdrawn from the Suez Canal Zone in Egypt. After the ending of the League of Nations mandate over Palestine in 1948, the only other British territory in the eastern Mediterranean was Cyprus. 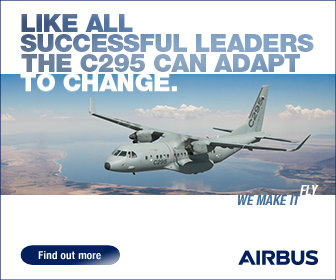 Consequently, the withdrawal from Egypt resulted in an enormous build-up of forces in Cyprus. This period also coincided with the outbreak of the internal security problems of EOKA in Cyprus, further increasing pressure on the RAF airfields on the island. Akrotiri, along with Nicosia, assumed a very important status, as virtually the sole means for projecting British airpower into the eastern Mediterranean, outside of aircraft carriers. In 1960, independence was granted to Cyprus, with the RAF maintaining both RAF Nicosia and RAF Akrotiri as airfields, controlled by the Near East Air Force. However, Akrotiri assumed more importance as Nicosia was used for greater civil aviation traffic. 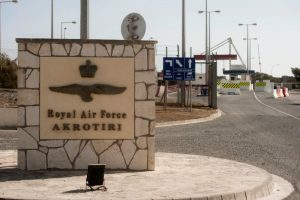 After 1966, it was no longer possible to maintain RAF units at Nicosia due to pressures of space, and Akrotiri became the only RAF flying station left on the island. In July 2006, RAF Akrotiri played a major role as a transit point for personnel evacuations out of Lebanon during the 2006 Lebanon War. Akrotiri was the location of the main transmitter of the well known numbers station, the Lincolnshire Poacher, although transmissions ceased in 2008. The station hosted the main hospital for British Forces Cyprus, The Princess Mary’s Hospital (TPMH), located on Cape Zevgari. This closed in November 2012 and cases too serious to be dealt with at the base health clinic are sent to the private Ygia Polyclinic in Limassol. In August 2014, six RAF Panavia Tornado fighter/bombers were deployed to Akrotiri to carry out reconnaissance missions over Iraq, following the rise of Islamic State in Iraq and Syria. On 26 September 2014, Members of Parliament voted in favour of the RAF carrying out air strikes on Islamic State in Iraq, and on 27 September the first two Tornado jets took off from Akrotiri loaded with laser guided bombs and missiles. On 30 September 2014, two RAF British Tornados successfully attacked and intercepted ISIS targets of a heavily armed truck, at the request of Iraqi Kurdish fighters. 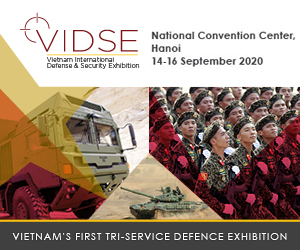 The station was used to support the 2018 missile strikes against Syria. Due to the station’s relative proximity to the Middle East, it is often used by British allies when needed, such as for casualty reception for Americans after the 1983 Beirut barracks bombing[ and as a staging post before heading into theatres of combat in the Middle East/Persian Gulf theaters. 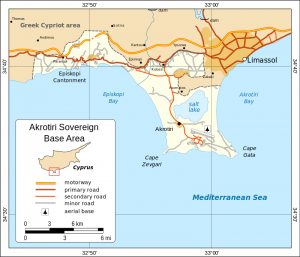 The UK has a treaty with Cyprus that guarantees British access to Akrotiri in any circumstances. Under the treaty, the stations employ many locals and contribute to the local economy. Red Arrows are seen flying over HMS Illustrious next to Akrotiri. The RAF display team, the Red Arrows, uses Akrotiri for winter display training. 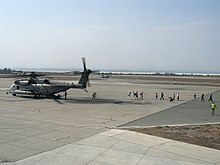 All Pictures & Maps Courtesy Wikipedia.